The Fisher Isotemp Laboratory Refrigerator offers you reliable cooling, and robust construction to fit your everyday lab storage needs. This 27 cu ft capacity lab fridge has an adjustable temperature range from 1-12°C with a preset of 4°C and an average stability of ±3°C, so it is best suited to tasks where precise control isn’t required. Temperatures are displayed digitally from the upfront exterior mounted LED screen with a resolution of 1°C. The construction of this laboratory refrigerator has a corrosion resistant white epoxy coated steel, with a solid steel door and hinge that holds the door open at 95° while you work and closes with a gentle push. The interior of this Isotemp Refirgerator has adjustable, coated steel wire shelving that can be moved in 1” increments. Of note, to operate efficiently this lab refrigerator requires a 2” clearance on the sides and back, and at least half an inch at the top. 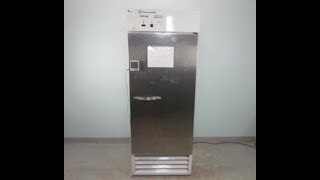 This Fisher Isotemp 4°C Lab Refrigerator has been fully inspected and comes with a current temperature report. All of our lab equipment comes backed with our standard warranty. Should you have any questions, please don't hesitate to contact us.